Ring! Ding! 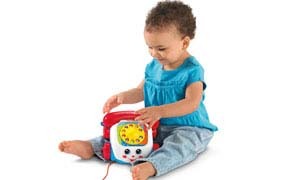 Little ones are answering the call for fun with the Fisher-Price Brilliant Basics Chatter Telephone! Its a classic roll-along pull-toy thats perfect for your little one. The Chatter Telephone features a friendly face and eyes that move up and down when the toy is pulled along, and exciting phone sounds to reward babys actions, too. Look whos talking, with the Fisher-Price Brilliant Basics Chatter Telephone! This adorable, classic pull toy has a friendly face and eyes that move as baby pulls it along on sturdy wheels, learning exciting role-play skills with their very own telephone. Itll get them chattingand strollinglike a pro! The Fisher-Price Chatter Phone features classic pull toy fun and a friendly face & eyes that move as baby pulls the phone along. Baby can sit & play or pull it along as she crawls or walks around. Exciting phone sounds reward babys actions. The Chatter Phone strengthens fine motor skills & eye-hand coordination. The Fisher-Price Brilliant Basics Chatter Telephone is equipped with a spinning dial, which baby can pick-up or hang-up, promoting fine motor skills and eye-hand coordination. The Brilliant Basics Chatter Telephone encourages baby to role play just like shes using a real telephone! 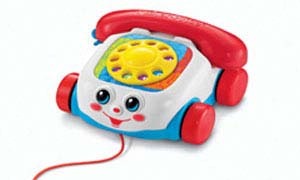 Dialing the phone and saying hello or goodbye encourages communication, as baby roles plays talking on a real telephone. The telephones moving eyes and realistic phone sounds encourage baby to walk and pull the phone along, developing gross motor, balance and coordination skills. Watching their faces light up as they explore, discover, play all those moments when children learn best. Thats why Fisher-Price builds learning into everything we make. With playful ways to engage curious minds, exercise little bodies, and nurture budding personalities. Because nothings more amazing than sharing the joy of learning with your child.